The ENERGY STAR Event Booth is a turnkey solution for holding an educational ENERGY STAR-themed event. 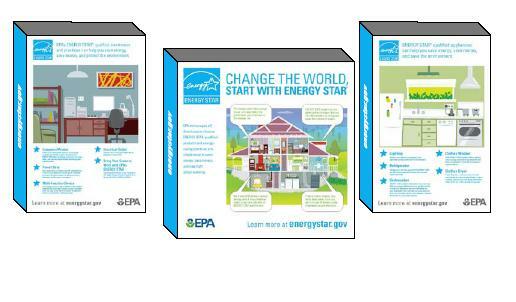 The booth is based on the ENERGY STAR @ home tool, with much of the same images and messaging as the exhibit house that has been featured at events nationwide. Lightweight and easy to ship and set up, the event booth features a total of six interchangeable panels depicting five rooms within a typical house. Each area highlights simple energy-efficient actions that can help visitors learn how to save energy, save money, and help protect the environment. Additional interactive elements, such as watt meters and lighting display hand cranks are also available for use with the event booth. Incorporating EPA's ENERGY STAR Pledge demonstrates how small changes can add up to big savings for the environment. If every American household took part in the Pledge, we would save more than 125 billion kilowatt hours of electricity, save $15 billion in annual energy costs, and prevent greenhouse gases equivalent to the emissions from 21 million cars. View photos of the event booth. Consider reserving the booth for family-focused events, employee seminars, educational opportunities, or to coincide with giveaways and energy efficiency demonstrations. This colorful, vibrant, interactive display is also perfect for trade shows, fairs, or other exhibit opportunities. Staffing: Two adults are required to staff the event booth when used in conjunction with the interactive displays; one adult is sufficient when the displays are not reserved. Event Requests: Due to the potential damage associated with high winds, rain, etc., preference will be given to events held indoors. Outdoor event requests within a large tent will be approved on a case-by-case basis. Feedback: Organizations that receive the event booth are encouraged to complete and return a feedback form at the conclusion of the event regarding the experience with the booth and event metrics. Damage: The event booth and interactive displays are inspected before and after each event. While minimal wear and tear may occur, EPA reserves the right to assess a damage fee to cover excessive damage to the fabric panels or exterior casing. **The event booth may be subject to unscheduled repairs that prevent it from being sent to a scheduled event. Event booth requestors will be notified as early as possible should this affect their event. Shipping: Organizations exhibiting at a hotel, conference facility or convention center may be required to pay for return shipment of the event booth and interactive displays, in addition to any other venue-related exhibiting fees, due to the additional costs required in those settings. Shipments cannot be made outside of the contiguous United States.